I’ve always loved going to Ocean Pond. (I’d love it even more if there weren’t any alligators.) It’s mainly a fisherman’s paradise, but when I was a kid, we’d sometimes go swimming there, and off and on through the years, my parents would invite family and friends to dinner at the Ocean Pond Clubhouse…fried chicken, rice and gravy, lima beans, rolls, iced tea, their locally-famous tomato casserole, and desserts—pie, cake, and ice cream. Heaven! 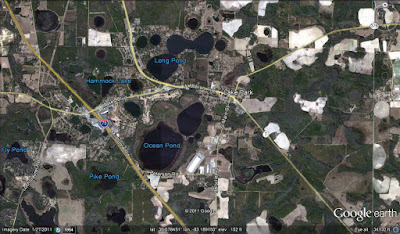 To reach Ocean Pond, you turn to the right off of Highway 41 South in Lake Park by the church on the corner of the highway and North Gordon Street. Cross the railroad tracks and pass through a small residential area dotted with a few houses. North Gordon Street deadends into Ricks Avenue. 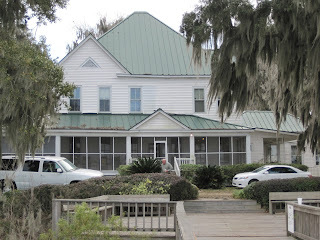 Turn right, then left and wind your way down a narrow, gravel road lined with Spanish moss-draped oak trees. The road follows along the shore. It’s like stepping back in time. This place feels ancient. Once you see the boathouses on the left, you’re nearly at the clubhouse. Google Earth aerial showing the location of Ocean Pond (it looks like two ponds separated by a causeway) in south Lowndes County. The road to Ocean Pond lined with Spanish moss-draped oak trees, March 2011. The Ocean Pond Fishing Club was incorporated in 1904 as the Ocean Pond Hunting & Fishing Club . After some financial trouble, the property was sold at a public auction in 1917. Subsequently, the club was reorganized as the Ocean Pond Fishing Club that same year . The names of the board of directors through the next several decades reads like a who’s who of Valdosta. Only members/share holders and their guests are allowed to fish, hunt, swim, eat, spend the night, reserve the clubhouse for parties, etc. I haven’t found a mention of when the clubhouse was built, but there’s a photograph of it from the 1890s in Images of America Lowndes County by Dr. Joseph A. Tomberlin (2007) . Some scenes for the HBO movie As Summers Die starring Jamie Lee Curtis, Scott Glenn, and Bette Davis were filmed there in the 1980s. They turned the screened-in upstairs of the old dock (since replaced with a newer dock) into a “crab shack” eatery for the movie. Ocean Pond—April 1986. The April sunset at old Ocean Pond is something beautiful to see—the warm red rim stays across the lake for a long while. The gradual darkness that follows becomes a friendly cloak around you. The ride to the lake is going back into the past, the old road, under friendly ageless giant oaks, covered by layers and layers of moss—all become a lavender haze in the shadows. History of Lowndes County Georgia 1825-1941. (General James Jackson Chapter, D.A.R., Valdosta, Georgia. Reprinted in 1995). Dr. Joseph A. Tomberlin on behalf of the Lowndes County Historical Society. Images of America Lowndes County. (Arcadia Publishing, Charleston, SC, 2007).